Forex analysis of the USD to CAD daily chart is giving us some mixed forex trading signals at the moment, with Friday’s candle suggesting a bullish tone, whilst in contrast Thursday’s bar indicated a bearish sentiment in the market. 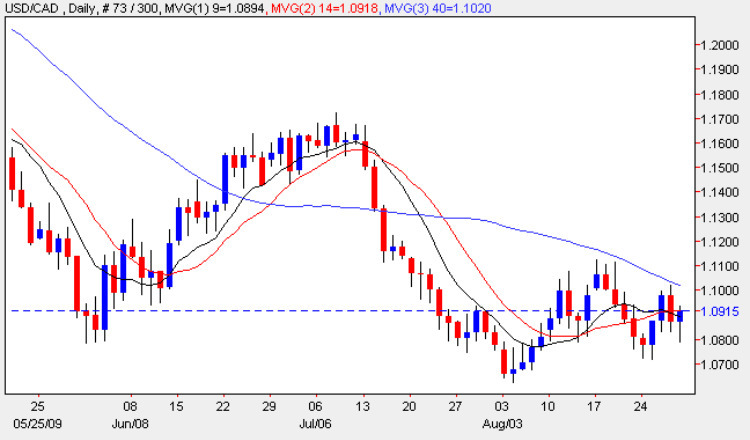 If we start with Thursday, the wide spread down bar suggested a bearish engulfing pattern to forex trading for Friday, which failed to materialise with the session ending higher, and with the deep lower wick of the trading session indicating that the US dollar bulls controlled the session. The depth of this shadow suggests that we should see the USD to CAD rise early in the trading week with the low of the session finding support just above the 1.08 level, a price point which has provided a bounce to the pair in the past, most notably in mid May. For any sustained move higher we will need to see a break and hold above the 1.11 price handle and should this be breached, we could see a move higher once again as US dollar strength returns to the forex market in the new quarter. With some countries closed for a national holiday on Monday, and therefore even thinner trading volumes, the focus for the fundamental news on the economic calendar will be the monthly GDP figures which are forecast at 0.2% against a previous of -0.5%. Canada is unique in that it is the only country to release monthly GDP data, all the others release theirs quarterly, and therefore the impact can be less muted at times as the changes from one month to another are less pronounced and therefore cause less of a surprise to the forex markets in general. The only other item of news in a quiet day’s trading is the Chicago PMI data in the US which is forecast at 47.4 against a previous of 43.4, which if achieved will add further evidence to the view that we are now moving out for the recessionary trough and into a long and sustained period of recovery.